Chartered in 1837, Rush Medical College is the oldest component of Rush University Medical Center, and the Rush Archives staff often answers the same questions related to the history of the school. Here are some brief answers to some of those frequently asked questions about the early years of Rush Medical College. Want more information? Don’t hesitate to contact the Rush archivists, Heather Stecklein and myself. We’re here to help. Is Rush really older than the city of Chicago? Technically, yes. Rush Medical College obtained its charter, March 2, 1837. Two days later, the city of Chicago was incorporated. At the time, Chicago had a population barely over 4,000 people. Unfortunately, the Panic of 1837 hit Chicago, and many of the donors who planned to support the school lost their funds. The school did not open until Dec. 4, 1843. Was Rush Medical College the first medical school in Chicago? Yes. The predecessor of Northwestern University’s Feinberg School of Medicine, the Medical Department of Lind University, later Chicago Medical College, was founded in 1859, several years after Rush opened. Surgeon Daniel Brainard (1812-1866) obtained the charter for Rush Medical College in 1837. He chose to name the school after a well-known and well-respected American physician, Benjamin Rush (1746-1813) of Pennsylvania. Rush was a signer of the Declaration of Independence and attended the Continental Congress. He was close friends with many of the Founding Fathers. Chicago was a small frontier town, and Brainard was only 24 years old with no reputation of his own. The lofty name of Rush matched the high hopes Brainard had for his endeavor. Was Rush named for Rush Street? Or vice versa? Although both Rush Street in downtown Chicago and Rush Medical College were named for Benjamin Rush, they were not named for each other. Some of our researchers assume that Rush Street was named after the school, thinking that the school was once located on that street. This is not correct. Where was Rush Medical College located originally? This question is worthy of its own blog post. 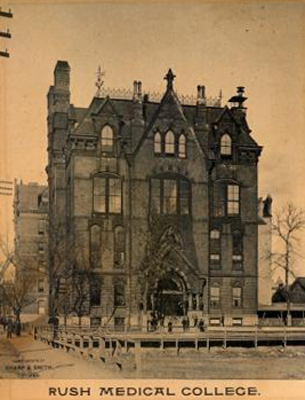 Briefly, however, the first permanent structure for the school stood at 77 North Dearborn in Chicago. The student body outgrew the building, and a new structure opened at Dearborn Street and Indiana (now called Grand Avenue) in 1867. Didn’t Rush Medical College burn down in the Great Chicago Fire? Sadly, the relatively new Rush Medical College building of 1867 was destroyed in the Great Chicago Fire in 1871. Hoping to avoid another tragic fire disaster, the faculty moved Rush Medical College to the west side of Chicago at the corner of Wood and Harrison Streets. The faculty also wanted to take advantage of opportunities to teach and practice at Cook County Hospital across the street. The first building Rush established on this campus in 1875 was replaced in 1923 by the Rawson Memorial Building. Have more questions? Leave a comment below. More questions will be answered in future posts. Nathalie Wheaton is assistant archivist with the Rush Archives. Rush’s archival collections date from the 1830s to present, and Rush’s archivists can answer any questions that you have about the people, events, and buildings that have graced this institution for almost 175 years. This entry was posted in Rush Archives, Rush University and tagged Benjamin Rush, Chicago history, Daniel Brainard. Bookmark the permalink.